Whether it was a restful night’s sleep on Italy’s Amalfi Coast or a mission for transparency in the market, these founders set out to create top-quality bedding at reasonable price points. How? Each cut out the middleman by launching online first. Here are the luxurious bedding brands you should be aware of—because you won’t find these names in your local design center. Parachute may be celebrating the opening of its third location (a cozy number in New York City’s SoHo neighborhood), but this minimalist bedding manufacturer has online roots that date back to 2014. After a dreamy night of rest under the luxury sheets of an Amalfi Coast resort, founder and CEO Ariel Kaye began learning more about the textile craft communities in Europe. Today, the company sources its chemical- and synthetic-free percale, sateen and linen from Portugal, and goes to Italy and Turkey for its tabletop and bathroom offerings. Husband-and-wife founders Scott and Missy Tannen saw an opportunity in the bedding market when store associates were unable to educate them on the quality and origin of a bedsheet. They set out to create not only 100 percent organic bedding, but also a transparent supply chain (not to mention crisp, sophisticated sheet sets). Boll & Branch stands by fair-trade principles for its farmers and factories. While most companies on this list stick to minimalist palettes and prints, Crane & Canopy sets itself apart with a bevy of bright colors and trendy patterns to choose from. And to top it off, many of the designs come with a beautifully embroidered finish. Founded by Karin Sun in 2012, Crane & Canopy sources extra-long staple cotton from “the same farms as the high-end brands,” then distributes directly to cut out competitors’ middleman fees. Talk about a bright idea. “Grown, spun, woven, cut and sewn in the USA” is the promise behind Wright’s cotton sheets. When Dan Hauber launched the company online in 2013, direct-to-consumer mattresses were its main foray. Today, the company, which is named after renowned architect Frank Lloyd Wright to reflect the company’s core values of design and craftsmanship, carries American-made pillows, blankets and sheets as well. The oh-so-soft offerings supply top-grade Supima cotton grown in California that’s then woven at a 400-thread count. Hill House Home’s signature colorfully piped linens debuted online in 2016. The company, which was founded by Nell Diamond to offer “bedding for dreamers,” has since opened its first retail store in SoHo. The made-for-Instagram storefront shows off Hill House Home’s tailored offerings amid bold wallcoverings and fresh florals. Brooklinen co-founders Rich and Vicki Fulop don’t claim to be veterans of the textile industry and its processes. Rather, they were just two people looking for quality bedding without the high costs. 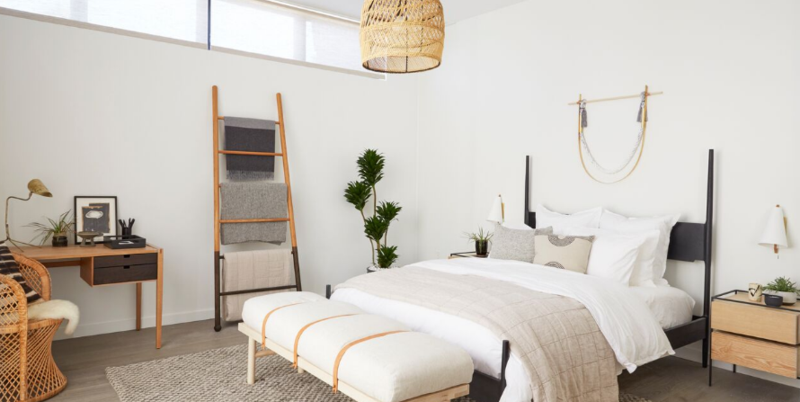 They launched Brooklinen in 2014 as a Kickstarter campaign, hoping to find others that valued “ridiculously comfortable sheets” and transparency in its origins. The company specializes in percale and sateen weaves to create their crisp, masculine-leaning sets. One of the newest bedding brands taking to the internet is Loomstead, founded by Sam Leiaghat in Los Angeles. Rooted in sustainability practices, the bedding manufacturer sources easy-on-the-environment Belgium flax linen and Egyptian cotton, both of which are also biodegradable, to create its high-quality, no-frill sets.